1. Single-minded Focus: You may not appreciate their all-consuming desire to eat your flesh, but they are committed to the task. They let nothing get in their way, except an ax to the brain. 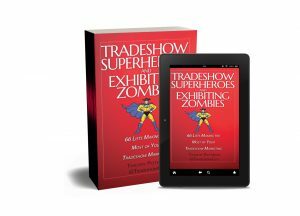 Your next trade show will be wildly successful, if you make it a priority, not an afterthought. 2. Teamwork Matters: Zombies travel in packs, like ravenous wolves. That teamwork ensures them a much higher percentage of kills. There’s a reason “We killed it” signifies success. By working together, those poor doe-eyed attendees don’t stand a chance.